Maintaining public relations is a brand building activity. With its roots in the early 1900s, Basil Clark is famous as the founder of public relations for his initiation of the Editorial Services in the United Kingdom around 1924. PR is practiced by almost every brand, organisation or individual to gain exposure in front of their potential clients, with the use of news articles, press releases, communication campaigns and topics of public interest. Public relation is characterized as a strategic correspondence method that generates mutual and helpful connections among associations and clients. A PR professional communicates with the intended interest group in a direct way or in a roundabout way through media, with an expectation to create and maintain a positive picture of the organisation or make a solid association with the potential audiences. Earlier there was only one definition of public relations, but with the changing era, PR has also changed and developed in several ways. Traditional PR and Digital PR are separated by strategies, including the way these connections are constructed and the routes by which they contact their potential clients. As time went on, a few brands grasped the open doors advanced technologies offered and developed into a completely new form of digital PR, leaving the others to obtain the title of ‘traditional’. Before we proceed further, it is imperative to comprehend that both PR type eventually share a similar goal – to improve reputation and develop recognition among the target groups of people. Though both traditional PR and digital PR have the same goal, their way of working is totally different. Even their target audience quality and quantity would differ from each other. On one hand, traditional PR managers work through the mediums like a press release, radio, and television; the digital PR industry focuses on communicating through blogs, social media, search engine listings and company websites. Communicating through television, radio and print media have their own benefits but the way the common public is accepting the digital world of social media, blogs and websites have a better impact. This does not mean that the traditional media has completely lost its impact. Earlier, brands conveyed authority by narrating stories about themselves and their connect with the people. It was all about being reflective and demonstrating what they were doing and what they were planning to do. However, this kind of approach was always questionable, as calculating the ROI was next to impossible since there didn’t exist a method to quantify the responses received through traditional PR. Digital PR believes in the formula of “Content is King”. Digital PR is all about sharing. It focuses on interactive writing, which is a two-way communication style. They subtly promote your brand but makes sure not to overdo it. Digital PR managers generate quality content that media professionals and bloggers want to share online. This content focuses mainly on problem-solving and communicating rather than advertising. This helps build a better relationship between brands and their audience. The digital PR team offers specialized services, which are aimed towards improving the perception of a brand. The sole purpose is to elevate the brand value. Online networking or social media additionally plays a vital part in the development of content for digital platforms. Social information enables digital advertisers to comprehend the socioeconomics and interests of target groups. 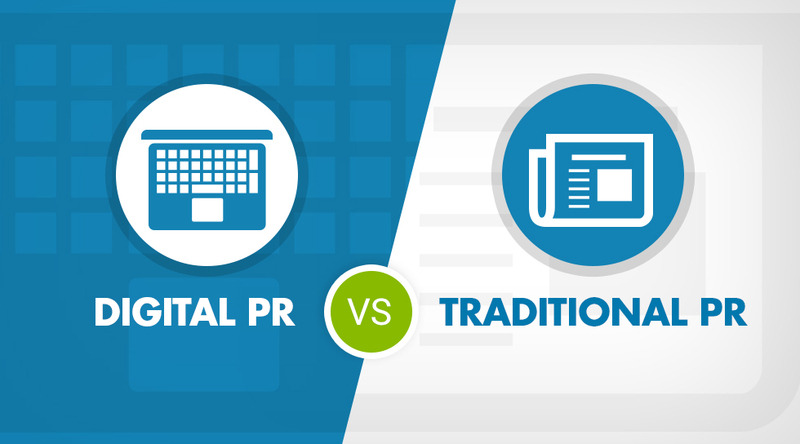 Choosing between digital and traditional PR is difficult. In the modern times, either cannot working in isolation as there is an intermesh of activities and strategies that define a PR campaign. The type of business, targeted audience group, and goals are the main factors in determining which PR method is best for an organisation. In some scenarios, it is seen that organisations follow both the traditional PR and digital PR to cover the market from every viable way. Think strategically, do proper research and choose the best option for your business’s success.